KANSAS CITY, Mo. (November 17, 2017) – From stocking stuffers to client gifts, André's has you covered with options including its infamous Chocolate Covered Almonds, signature hot chocolate blends, tea cookies and more. André's Confiserie Suisse has something for everyone. The local, family-owned chocolatier built upon three generations of Swiss confiseurs has perfected its holiday selections throughout its more than sixty years in business. André's has compiled a list of twelve of its most popular holiday items to enjoy this season. Fresh​ ​nonpareil​ ​almonds​ ​roasted​ ​to​ ​a​ ​golden​ ​brown, ​delicately​ ​caramelized and​ ​coated​ ​with André’s​ ​signature​ ​Swiss​ ​milk​ ​or​ ​dark​ ​chocolate. André’s​ ​finest​ ​French​ ​sea​ ​salt​ ​caramels​ ​covered​ ​with​ ​signature​ ​milk​ ​or​ ​dark​ ​chocolate and ​made​ ​by​ ​hand​ ​from​ ​pure​ ​cane​ ​sugar. ​​A​ ​delicate​ ​dark​ ​chocolate shell​ ​surrounding​ ​the​ ​bold, ​ ​yet​ ​smooth, ​ ​Kansas​ ​City​ ​Whiskey​ ​by​ ​local​ ​distillery, ​ ​J.​ ​Rieger​ ​&​ ​Co. Note: These are extremely delicate and cannot be frozen due to their liquid centers. André’s​ unique​ ​blends​ ​are​ ​available​ ​in​ ​​12​ ​oz.​ ​tins: ​ ​Signature, ​ ​Chili​ ​Spice, ​ ​Extra​ ​Dark​ ​Grand​ ​Cru​ ​& Ginger​ ​Spice. ​ ​The ​Signature​ ​blend, ​ ​made​ ​with​ ​rich​ ​Swiss​ ​chocolate, ​ ​is​ ​also​ ​available​ ​in​ ​a​ ​new​ ​4 oz.​ ​gift​ ​bag. This chocolate candy has a​ ​delicate​ ​layer​ ​of almond​ ​cake​ ​soaked​ ​with​ ​Grand​ ​Marnier​ ​Liquor, ​ ​covered​ ​with​ ​rich​ ​chocolate​ ​ganache​ and coat​ed ​with​ ​signature​ ​dark​ ​chocolate. Santas in all sizes, each available in milk or dark chocolate, as well as mini white chocolate snowmen. André’s uses special molds and hand decorates each Santa and Snowman, packed ready to ship. Holiday​ ​coffee​ ​cake​ ​made​ ​with​ ​pure​ ​butter, ​almonds, ​ ​pecans​ ​and​ ​candied​ ​fruit. André’s​ ​signature​ ​milk​ ​or​ ​dark​ ​chocolate​ ​molded​ ​into​ ​a​ ​large​ ​wine​ ​bottle​ ​or​ ​smaller​ ​champagne bottle​ ​and​ ​filled​ ​with​ ​André’s​ ​popular​ ​milk​ ​or​ ​dark​ ​Chocolate​ ​Covered​ ​Almonds. Whether it's the chocolate dipped butter cookies filled with rich chocolate ganache or the traditional chewy chocolate hazelnut brunsli cookies, this seasonal assortment is perfect for any holiday gathering. Slivered​ ​almonds​ ​carefully​ ​roasted​ ​and​ ​caramelized, ​coated​ ​with​ ​either​ ​milk​ ​or​ ​dark​ ​chocolate, then​ ​hand​ ​shaped​ ​into​ ​a​ ​wreath​ ​and​ ​garnished​ ​with​ ​marzipan​ ​leaves​ ​and​ ​candy​ ​holly​ ​berries. Six​ ​inch​ ​diameter. A​ ​box​ ​of​ ​four​ ​unique​ ​gingerbread​ ​(lebkuchen)​ ​holiday​ ​ornaments. ​ ​Visit​ ​the ​store​ ​for​ ​a​ ​variety​ ​of other​ ​gingerbread​ ​items​ ​including​ ​Bieber​ ​ (filled​ ​with​ ​almond​ ​paste), ​ ​Filled​ ​Gingerbread cookies​ ​ (filled​ ​with​ ​all​ ​natural​ ​raspberry​ ​or​ ​apricot​ ​jam​ ​and​ ​coated​ ​in​ ​chocolate), ​ ​or​ ​a large​ ​gingerbread​ ​sleigh​ ​filled​ ​with​​ ​​assorted​ ​chocolate​ ​candies​ ​and​ ​tea​ ​cookies. Molded​ ​milk​ ​or​ ​dark​ ​chocolate​ ​pinecones​ ​filled​ ​with​ ​chocolate​ ​covered​ ​almonds​ ​or​ ​assorted chocolate​ ​candies. Soft spiced cookies, reminiscent of gingerbread, with a citrus icing. Traditional “Yule Log” made with layers of cake and buttercream, wrapped in signature milk chocolate, then hand decorated with marzipan leaves and flowers. Similar to a French Macaroon but made with a smooth buttercream filling. Available in an assortment of seasonal flavors. This list is just the beginning of the holiday items André’s has to offer. Other signature holiday items include its Marzipan Santa, Marzipan Fruit, Fruitcake, Chocolate Candies, Truffles, and Anise Cookies available for order. In honor of Cyber Monday, André's is offering free ground shipping (or $15 off express shipments to areas in CA, FL, AZ, AK & HI) on all online orders over $75 November 23-27. Must be shipped by December 4. Single destination only. Enter code BlackFriday2017 at checkout to apply discount. This holiday season, André's is offering special discounts on large orders when you order more than 20 of the same item. Orders can be made by calling the store at 816-561-3440. For more information, visit André’s at www.AndresChocolates.com. 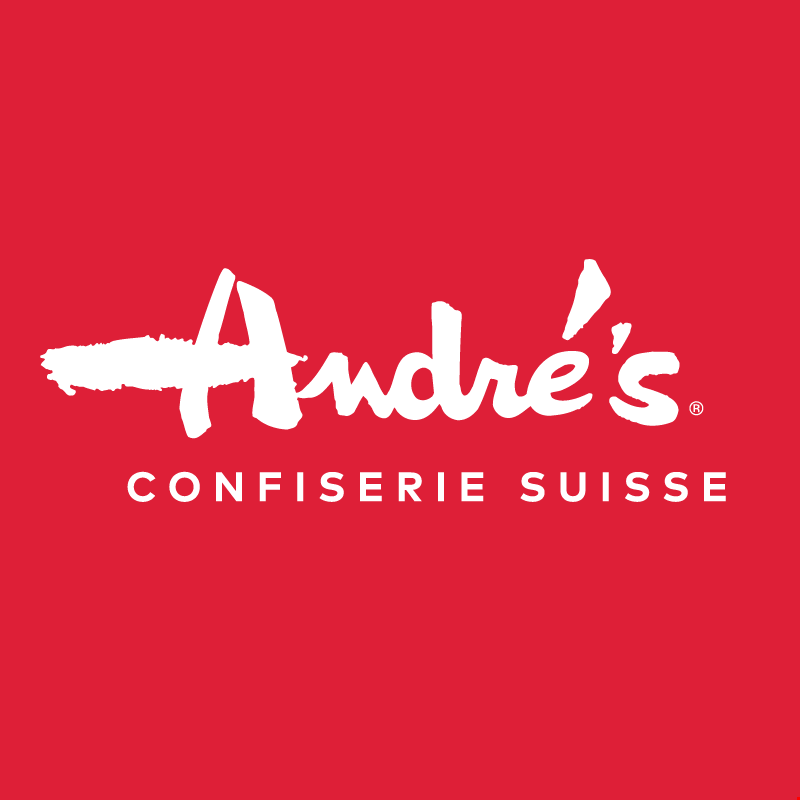 André’s Confiserie Suisse is one of America’s premier chocolatiers built upon three generations of Swiss confiseurs. The multifaceted family-owned business has been a staple in Kansas City since 1955. André’s Confiserie Suisse is located at 5018 Main Street, Kansas City, MO 64112. Follow André’s on Facebook at facebook.com/andreschocolates, on Twitter @AndresSwiss and on Instagram at @andresswiss. Visit André’s online at https://andreschocolates.com/.